Prospective homebuyers aren’t being scared away by rising mortgage rates — even if they creep up over 5 percent for a 30-year mortgage — according to a new study from Redfin. Of the more than 1,300 respondents surveyed by the Seattle-based real estate brokerage in May, only 5 percent said they’d call off their home search if rates — which recently climbed to 4.5 percent — hit the 5 percent mark. Conversely, 24 percent said such an increase would have no impact on their search. 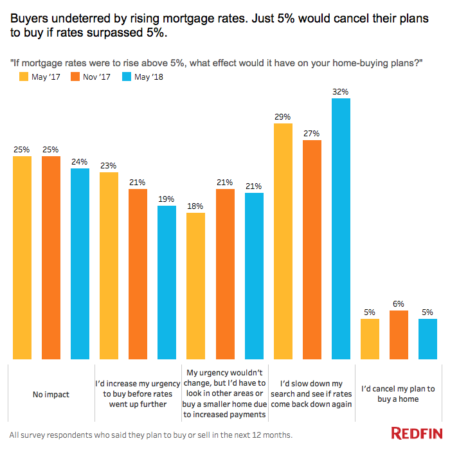 “Homebuyers are well-aware that higher mortgage rates means higher monthly payments, but mortgage rates remain very low, historically, and buyers will make compromises,” said Taylor Marr, senior economist at Redfin in a release. The data is pretty consistent with similar surveys, that Redfin conducted in both May and November of 2017. The survey reached out to 4,264 people from the general population who had indicated they had either bought or sold a home sometime in the past year, tried to buy or sell a home within the past year or plan to do so this year, according to Redfin. Mortgage rates have stabilized in recent weeks, according to the latest data released by Freddie Mac, after rising steadily from 4 percent to slightly more than 4.5 percent over the past year.